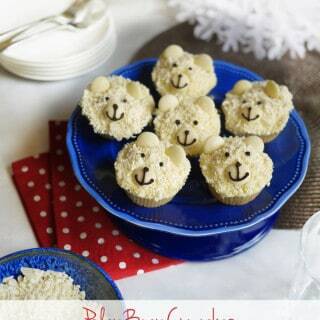 This easy Polar Bear Cupcakes recipe is the perfect Christmas or festive cake bake. Really fun to make with kids, using white chocolate. Take a cupcake and coat the top completely in the icing using a palette knife. Roll the cupcake around, icing side down, into the grated chocolate. Decorate with chocolate buttons and the icing writing pen to give your polar bear a face.